You have explained why I prize your blog above all others. You are the Camellia blossom in my hospital ward, the rainbow after a squall, the reason to strive. Add me to the list, too, Doug! That’s quite sad Valerie that a section of society can appreciate beauty but doesn’t have access to it. I also hope the flowers you arranged are still being delivered, it can be a great aid to getting well. It does say much for your lodger that she could share her flowers with others no matter how few. Happy new year to you too, David…. Valerie, what a beautiful and touching story. I do love the way you unfold a theme so gracefully, with delightful twists, tucks and turns. I’ve been reading more of ‘The Sound of Water’ on the beach today, and am continuing to love it. Dear Juliet, as a skilled writer yourself, I really appreciate the things you say about this post, thank you so much. So glad you’re enjoying my book. I’m finding yours – ‘Spiritual Aging’, fascinating..I’m terribly impressed with the technical expertise, the lay-out and the way you’ve organised it. And I’m also impressed with how you tackled the subject, and love the quotes….you write so well, it’s such an impressive achievement. I think I’m going to find it very useful in about ten years !!! Good, I’m glad you’re happy to be inveigled up here!!!! Thank you Valerie, for your kind comments. I note that you, along with many others, convert the title of my book from ‘Spirited Ageing’ to ‘Spiritual Ageing’ – isn’t that interesting? It is being read by people from 40 to 92, so I love what you say about continuing to find it useful in 10 years time. Hello Juliet, I grovel over wrongly naming your book – so sorry… I suppose that’s where we’re at ! By my comment I actually meant I’d Start using it in ten years !!!! I don’t admit yet that I’m aging !!! See you soon ! In the darkest hours, I close my eyes and visualize beauty. Sometimes it is in the form of a sunset, a flower, a gentle stream; but mostly, it is in the words of a compassionate storyteller who understands that beauty is the outflow of love and joyfulness. Happy new year to you, and lots more fascinating posts to read, please !!! Thank you Rebecca, I rushed to my King James version, and found those beautiful words there…the whole chapter is so gorgeous ! How wonderful to think of those few flowers making a world of difference to so many. (Was that the secret of the 5 loaves and 2 fishes? That they were beautiful 😉 ) I do hope the flowers are still sent to the hospital. 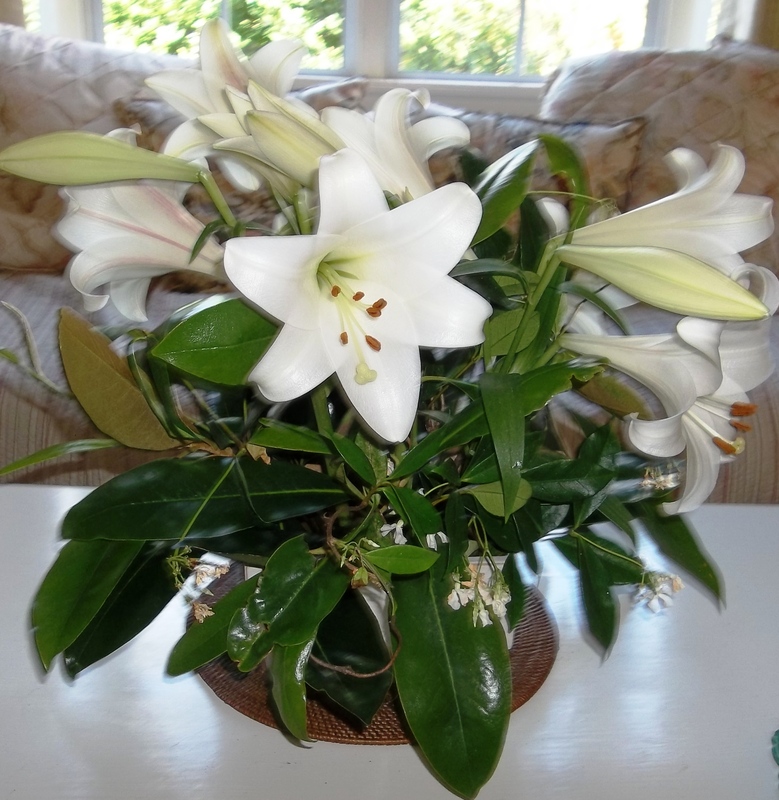 The flowers in your photo are beautiful too but how do you manage to keep the star jasmine alive in the vase? I have tried to use it several times, very unsuccessfully. What a beautiful story. I’ve often been conscious for the need we have for beauty. Even when I had little money, I would pick up a pretty candle at the dollar store, or a plant on sale, to add a touch of beauty to my life. Somehow, beauty nurtures our soul. I so agree Joss… I also would squander money I couldn’t afford on something pretty to light up our lives ! Thank you, lovely to hear from you. This morning your words are the flowers adding some beauty to a current sad and brown situation. I smile through intermittent tears. Thank you for the reminder to appreciate beauty in unexpected places. I love this story so much, it’s really touched me on a wild and windy day here in the UK. There’s beauty in so many things and that, I think, is what makes life worth living. Thank you Andrea, good to hear from you, and thank you so much for a mention in your fascinating story. I love wild and windy days… it must be lovely there… where- abouts in the North country? Yes up in the north east, not far from Newcastle upon Tyne. Valerie- such a truly beautiful story. Completely brightened a gloomy return-to-work day with the reminder of the importance of maintaining even small elements of beauty at all times. Thank you! Thank you so much , I’m so glad you enjoyed the story…. and glad it brightened a work-a-day day !!! A must read for a new year attitude ajustment. You have refreshed my soul with your words. Thank You. Dianne, that is a beautiful thing to say – a real; gift – thank you, and thank you for passing on the story – as it were !!! Valerie, this made me cry. Thank you for the beauty you bring to my life. Enthralling as usual. I agree that Maslow’s theories are often wrong. Even when basic needs haven’t been met there is a drive towards art and beauty – sometimes even resulting in those needs being neglected. Thank you so much – I found your comment fascinating – I hadn’t thought about it, but you’re right, the drive towards art and beauty does sometimes mean that the basic needs are neglected… even by the artist starving in his garret, instead of trying to make a living more mundane ! Valerie, I was nodding my head as I read your lovely post. To be beauty-less in a culture that has produced so much beauty is so very sad. Beauty doesn’t have to be big and expensive and it can be found almost everywhere. I found that because I take photos, I’m always looking and finding beauty, even in the most unexpected places. As an avid reader, I like beauty in writing. Too often these days, a book that’s filled with a good story has little beauty in it. Have you ever read any Elizabeth Goudge? She has some of the most beautiful writing and stories that I’ve ever read and I often come back to her books when I’ve had a surfeit of bad language, violence and other situations. I think you’d like her. I hope you had a beautiful Christmas and have a blessed 2014. What a lovely comment Janet, so glad you enjoyed the post. I know just what you mean about Elizabeth Goudge – I’ve been a devoted fan since I read Green Dolphin Country when I was sixteen – never guessing that I’d end up living in Green Dolphin Country myself – New Zealand!. Such a lovely story about the hospital flowers. So touching !! WordPress Staff are not going to stop them commenting. It is suggested that you Moderate Comments by going into Dashboard/Settings/Discussion and checking/ticking “Before a comment appears Comment must be manually approved ” Save the page then trash or spam any future bad comments as they come in. I had 36 which I sent into spam. It may seem silly to you but I work with forces, the good guys, in other realms, preceding the Return of Christ. The comment idiots will be taken down hard and anyone else like them. WP Staff do not have the will to clear such commenters from their organisation. But it will be done. You are doing everything you can Valerie and doing it right. Well done. Everything is beautiful if we only can see is so right and so perfect to your story! I am so impressed with the life you have lived, you make mine seem so bland by comparison! I find I am smiling through tears at this story. You are a compassionate and beautiful soul, I am always filled with gratitude after reading you. Valerie, your post made me remember the documentary Beauty Matters by the Brits philosopher Roger Scruton in which he presents a provocative essay on the importance of beauty in the arts and in our lives. See it; it is wonderful, spot on and leaves you with a tear. I wish you a wonderful NYE and a happy start of 2014. Dear Paula, thank you so much for this marvellous video, I’ve watched it several times and am sending it to all my friends – it says exactly what people like you and I have always felt in our bones, I’m sure ! I hope your holiday was full of bliss and joy,…. Such a beautiful, touching story, Valerie. You so often remind us that the smallest outreach can make a big difference. It’s one of the reasons I love reading your posts so much. All the best for a wonderful new year! Dear Letizia, lovely to hear from you, and I’m so glad you enjoyed the story…. I love it that you enjoy my posts, but you know I don’t set out to remind us of anything… I write what’s on my mind ! and it’s wonderful that you enjoy reading it! Thanks Valerie. A Very Happy New Year to you too! RE: Maslow and Beauty, see his B-values. Beauty was very important. It’s amazing that those few flowers could be so transformative. But if the hospital ward was as bleak as you describe it, I understand. Beauty is more than a luxury. Abraham Maslow really should have included it in his hierarchy of needs. At our Saturday Market in the summer here, the flower vendors do a brisk business. I find it such a pleasure to see people walking back to their cars or homes with their arms full of flowers. Thank you for commenting, good to hear from you … yes, there’s nothing like flowers to loft the spirits and bless any space, is there…. A beautiful story, Valerie. It seems to me that beauty puts us in touch with our souls. It takes us out of the mundane and into a place where hope and joy abide. Perhaps the world would be happier if the arts were celebrated more instead of being the first cuts from school and community programs. So wonderful, the smell and the sight of a single flower keeping the mind too satiated for the pain to intrude.I have always striven to live in a beautiful place, where I could look out my window and see a flower, a tree branch, a bit of blue sky. Beauty has always filled my heart and made me feel a little less alone. Thank you so much for your lovely comment. I know exactly what you mean about always living in a beautiful place, and yes, I too have sometimes just relied on the beauty of a rose to keep me going through despair and desolation !! !It is the gift and comfort of the universe. While I was reading your wonderful and impressive story I thought of one of my favourite books for very young children. In that story the mice are spending the summer collecting nuts, seeds and berries for the long winter. All except Frederick who collects colours, sounds, rays of sun and beautiful summer memories. The other mice think he is a bit lazy or weird and some even laugh at him. But when the long cold winter moves along and the last grain is eaten, Frederick still has plenty of colour, sound, sun rays and summer memories to share which the other mice now cherish. Somebody gifted that book to me when I was a very young child, myself, and I always felt that it holds so much beautiful truth. Later in life I learned that Frederick who can see the beauty in everything gives a great excample to us. And the experience you shared here, shows that we can all use a bit of that in our lives. I so hope the cathedral and hotels are still sending those flowers to that hospital in Honkong.